Michelle Quiroz prepares coffee at Reserva Coffee Roasters on Monday, Jan. 8, 2018, in McAllen. When Michelle Quiroz walked away from a 12-year career in engineering to pursue her passion of coffee, it wasn’t without apprehension. Some questioned her resignation to pursue her passion. 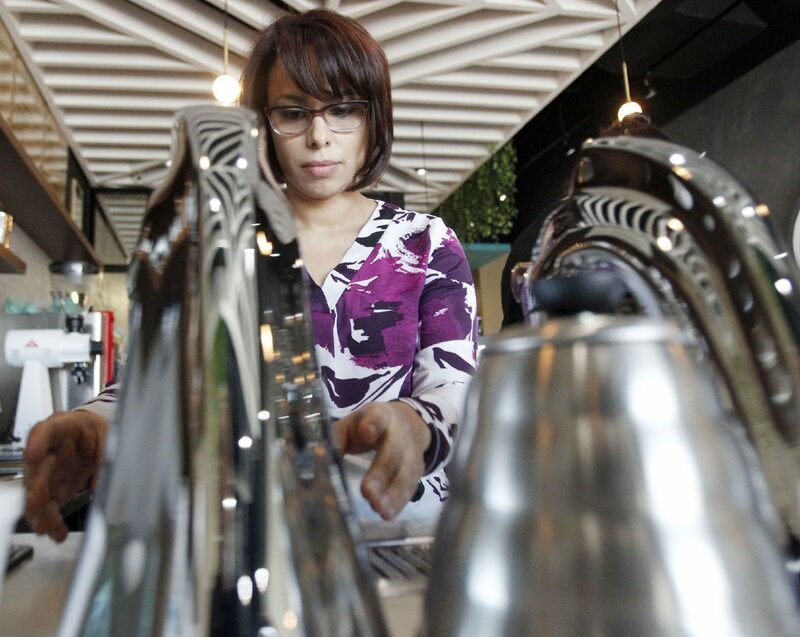 The La Joya native, who is the co-founder and owner of Reserva Coffee Roasters, said she sometimes sits in the cafe pondering her entrepreneurial future. Her makeshift office — a laptop open at a bar separated by glass exposing the kitchen — is strategically in sight of the counter. Behind the pane, a man prepares a sheet of pastries. Most of the treats are made that morning and gone by the afternoon. Quiroz crafted the menu in her home over two months, enlisting friends as taste testers. She combined brown sugar, ginger powder and cayenne to a latte. She infused green tea powder into horchata and created a non-caffeinated drink for her kids to feel included. Signature beverages emerged through trial and error. With no training, Quiroz and her husband dove into the world of coffee-bean roasting two years ago. After several false starts with green coffee bean distributors, the couple acquired four 150-pound costals — the minimum an importer would sell them. The pair experimented in their garage to learn the trade. It took about six months to learn how to roast coffee, she said. They rented a warehouse in Mission to house their roaster. They began selling freshly roasted bean at local trade shows. Customers would ask the same thing: where is your coffee shop located? Opening a cafe wasn’t the initial plan, she said. In fact, it wasn’t until last year that her decade-long dream felt realistic. As a customer approaches the counter to order, Quiroz excuses herself to help him. She attributes her leadership style to building and running businesses in her previous profession. Part of optimization, she said, is understanding how things work. “I get in there regularly with my employees — baristas and bakers — to understand how can I help them be more efficient in their job,” she said. With her experience in mechanical and manufacturing engineering, Quiroz approached the creation of her shop the same she did with her clients. She sketched the layout like arranging large, automated machine tools, welding units and machining centers. Quiroz partnered with Claudia Chanin, of NOMA Design Studio, to help with conceptualization and building the space. “We started seeing the needs of the equipment to create the space around it,” she said. In particular, the workspace is built around the Rio Grande Valley’s only under-counter espresso machine. They started seeing the needs of the equipment to create the space around it. “It’s a small shape, so we wanted to create a shock when you come in,” Chanin said. She incorporated inspirations from her travels to Asia and Europe. Greenery was something she noticed in Hong Kong and Singapore. “We can’t talk about one element. It’s a composition,” Chanin said. “So every element plays a role in the overall look. Local coffee shops provide welcoming environments to sit and have conversations, Quiroz said. Before opening, Quiroz introduced herself to her specialty-coffee competitors. Customers having options will “help us stay on our game,” she said. She values her relationship with other indie coffee-shop owners and expressed appreciation of being part of a network spanning the Valley. Quiroz says there are enough coffee drinkers locally to go around and support all of their businesses. She’s encouraged by the number of people who have come through their doors since opening last month. As an engineer, she’s helped others build their businesses. She’s excited to apply that knowledge to her own, she said. “Putting everything together to make this happen has been the greatest joy. You can’t be afraid of the unknown,” Quiroz said. “You have to take calculated risks, and for me, I think this is something that was worth it. Reserva Coffee Roasters is located at Palm Crossing near the McAllen Convention Center.